H.E. 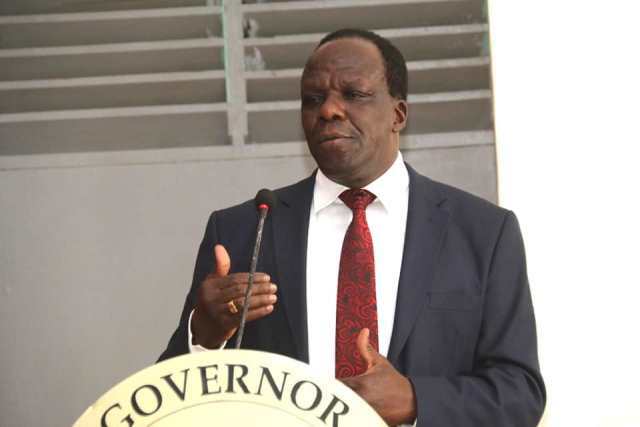 Wycliffe Ambetsa Oparanya has announced that his government has set aside Shs100 million to support micro and medium business enterprises through the newly established Kakamega Microfinance Corporation. The Corporation succeeds the defunct ‘Mikopo Mashinani’ programme which he said did not perform well due to weak institutional and legal framework. He made the remarks today during a ceremony to assent to four bills namely; County Microfinance Bill 2018, Trade and Licencing Bill 2018, Investment and Development Bill 2018, and the Lake Region Economic Bloc Bill 2018. Besides assenting to the Bills, the Governor also presided over performance contracting signing ceremony with County Executive Committee Members and the County Secretary who is the Head of Public Service in the county government. Also present were H.E. the Deputy Governor, H.E. Prof. Philip Museve Kutima, CEO of the Lake Region Economic Bloc, Mr. Abala Wanga, the County Secretary, Madam Jacinta Aluoch Odhiambo, CECMs, Chief Officers, Advisors in the Office of the Governor and the Lead Performance Contracting consultant, Dr. Henry Wati among others.